Michael Jackson’s glove. B.B. King’s guitar. Elvis’s jumpsuit. South Shore’s new Hard Rock Hotel & Casino houses an extensive collection of rock and roll memorabilia (the King actually performed 106 shows in the building in the early 1970s, which at the time was Del Webb’s Sahara Tahoe). The 539-room hotel is also home to Park Prime, a high-end steakhouse that opened in January as part of the property’s $60 million transformation from the old Horizon hotel. An upscale oasis from the flash and bling of the adjacent casino floor, the 98-seat rustic chic restaurant boasts an earth-tone palette: white-washed paneling, dark wood beams with bars of Edison bulbs, distressed brick walls and hardwood floors lend the lively spot a sophisticated and modern vibe. Well-spaced tables—no white linens here—plus banquettes and curvy booths seat an eclectic mix of patrons. The elevated bar at the entrance, where a soloist performs on weekends, accommodates another 17. The restaurant’s concept is built around the Park family, which owns the property (along with a large swath of South Shore). One of Northern Nevada’s largest landholders and oldest ranching families, the Parks’ Carson Valley property is depicted in stylized photos hanging on the plastered walls. A triptych of bovine-inspired burlap art is mounted on weathered barn wood and another big, old longhorn stares from the back wall. No mistaking that this is, well, a steak house. 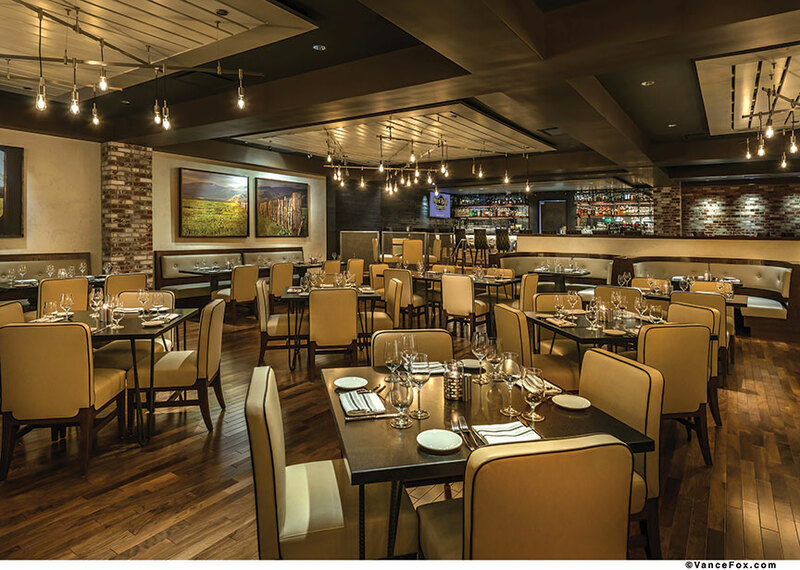 Chef Ryan Love oversees Park Prime’s menu, which features Durham Ranch grass-fed, free-range, all-natural beef. If it’s difficult to decide among the starring line-up of filet mignon, prime New York strip and Wagyu flat-iron, the three can be ordered together in the Park Steak trio. A 20 ounce bone-in prime rib eye is also offered. 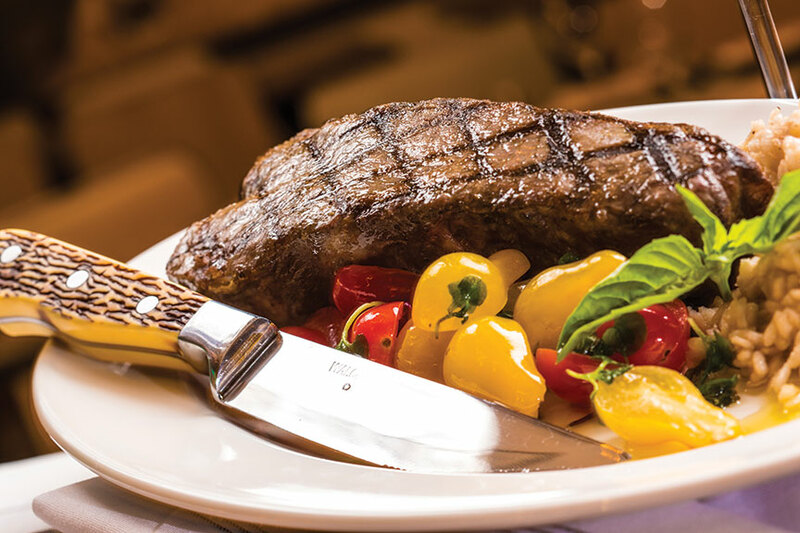 What makes Park Prime’s meat a cut above? Steaks can be ordered au poivre, with a Maytag blue cheese crust, Oscar style or served with sauces such as Bordelaise, Béarnaise, chimichurri or horseradish. 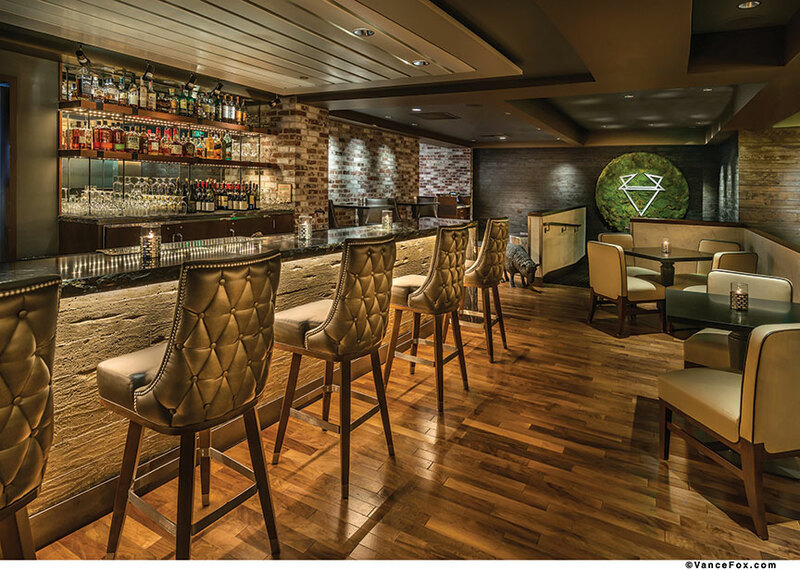 Ocean-going options include miso-glazed sea bass, pistachio-crusted scallops, pepper-dusted yellowfin tuna, pan-seared salmon, cold-water lobster tail and Alaskan king crab legs. All entrees are served à la carte, but side dishes like sautéed mushrooms and mascarpone stone-ground grits can easily feed two or more. Seafood also plays its hand well in the starter section: A spicy ahi tartare is tossed with soy, sambal vinaigrette and fresh mint and topped with microgreens. Fried calamari gets dusted with chili and tossed with basil, radicchio and caper aioli. The crab cakes, mostly meat rather than filler, arrive sweet and crispy brown atop a bit of crystal remoulade. Seasonal oysters, served on the half shell raw with Champagne strawberry mignonette or Rockefeller with spinach and Pernod, are delivered from the adjacent oyster bar. Beware of the basket of warm, freshly baked bread delivered to the table. While perusing the menu, sip on a Tahoe-titled cocktail like the MS Dixie, mixed with vodka, Saint Germain and fresh grapefruit juice. The California-centric Wine Spectator–aspiring wine list contains about 100 bottles. Just hit the jackpot? Buy a bottle of Napa’s cult cabernet, Screaming Eagle, for $3,133. About 20 wines are available by the glass, including pours like the lesser known but lovely and well-priced Blindfold white blend by the Prisoner Wine Company. A 40-year-old Dow tawny port pairs nicely with the warm chocolate lava cake for dessert. Service is smooth and professional, and given that this is the Hard Rock, a throwback soundtrack rolls in the background. Indeed, an evening at Park Prime comes together so memorably that it might seem like the King is in the building, still.